Batley - Handsome Bouncy Boy! 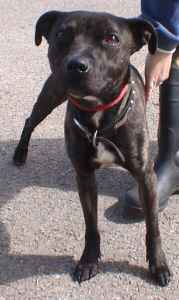 Batley is a male Staffordshire Bull Terrier cross, aged around 2 yrs. He is typical of his breed, being a happy, friendly, bouncy and waggy boy, but is in need of a home! Batley is currently in our emergency boarding kennels in the Merseyside area, where he has been since 7th August 2007. His stay there has enabled us to carry out an assessment, and he is now ready for homing. Batley is wormed, flea treated, neutered and vaccinated. Anyone interested in homing Batley needs to contact us or telephone Margaret on 07946 739038 for an informal chat.